At the end of Part I, the Sourcing Maniacs had just completed their Aravo visit, the first stop on their journey. After Aravo, they took a trip to Massachusetts to visit their old friends Pinky and the Brain, but were unsuccessful as their friends were under lockdown until the annual user conference. However, being in the Boston area, they decided to continue their vendor tour through the sourcing alphabet and decided to pay a visit to Apriori, home of the Wizard of Cost, before moving onto the B’s. We join them on their hearty jaunt up Baker Avenue in Concord, MA. We’re off to see the wizard, the wonderful Wizard of Cost! Yakko At Apriori, of course! Yakko As sure as a Massachusetts black bear does his thing in the woods. Wakko But where’s the big neon sign? Dot And the big corporate headquarters? Yakko Not all companies own their own buildings, Dot. And not all companies feel the need to throw up flashy 1950’s neon signs to advertise their business. After all, those signs cost money. And I think cost management is supposed to be about not spending money you don’t need to spend. But that’s what we’re here to find out, isn’t it. Dot I sure hope the Wizard of Cost can see us! Wakko And that we don’t get shut out again. I mean, we were wako’d by Ariba, but we were almost wak’d yesterday! Yakko I don’t think we’ll be shut out here. the doctor tells me that Apriori are very friendly and open people. Wakko But will they welcome us with open arms? Yakko Well, I never really asked if they’d welcome us. But we’re solo now … and I don’t think they ever competed with Ariba anyway. I’m sure they’ll talk to us. Dot After all, who can resist pretty lil me. Dot strikes her cutest pose and starts fluttering her eyebrows shamelessly. Yakko So who wants to knock on the door? Wakko I do! I do! Wakko takes out his rubber mallet and waks on the door. The Wizard of Cost Hello? The Wizard of Cost Yes, I know who you are. Can I help you? Yakko We want to learn about enterprise cost management! Wakko And beg for food! Dot And find a job! The Wizard of Cost Well, I can certainly help you with the first topic. I’ve made it my personal mission to spread the word of enterprise cost management and how it can help direct sourcing organizations, as well as manufacturers, save money in these troubling times. 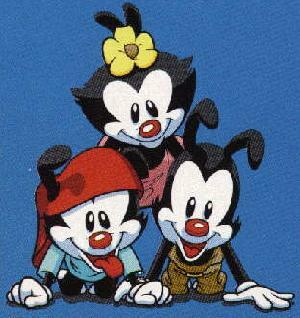 Wakko, Yakko, & Dot That’s great! The Wizard of Cost But you have to promise me something first. Wakko plops down on the floor. Wakko We’re all ears! Wakko stretches his ears in his best Dumbo impersonation. The Wizard of Cost and behave. You have a bit of a reputation, and we’re a no-nonsense operation here at Apriori. The Wizard of Cost Promise? Wakko, Yakko, & Dot We promise. The Wizard of Cost Then take a seat and let’s begin. The Wizard of Cost Let’s start with the basics. Every business is in business to make a profit. Profit is defined as the difference between revenue and cost, or, the difference between the money you take in from sales and the money you spend on supplies, overhead, and taxes. That says there are fundamentally two ways to increase profit – increase sales, which falls under the purview of Sales and Marketing, and reduce costs, which generally falls under the purview of supply & spend management. We focus on cost. However, not all costs are equal. If we look at a balance sheet, we see there are three main types of costs: COGS (Cost of Goods Sold), SG&A (Selling, General, and Administrative Expenses), and D&A (Depreciation and Amortization), and that COGS usually represents 80% of the costs under enterprise control. So, unlike many e-Procurement firms that just try to reduce the cost of the transaction, which only serves to reduce SG&A expenses, we focus on reducing COGS, as every dollar reduction in COGS has five to six times the impact of a dollar reduction in SG&A. To reduce COGS, we start with the understanding that COGS is a combination of raw material costs, labor costs, production overhead costs, and margin. All of these costs can be reduced with the right insight — and this is where we are different than a standard sourcing application that just tries to get you the lowest price per unit through a volume buy or leverage-based raw material buy. Then we help you identify the right product, produced by the right process, to meet your needs at the lowest possible cost. Wakko How do you do that? The Wizard of Cost We have software that implements a virtual production environment that not only allows us to model a part, but an entire production process. This allows us to calculate not only how much a modeled part should cost, but whether or not there are other processes that could be used to create that part. For example, if you have a door hinge, you have a bend, a cut, and some hole punches. And there’s more than one way you can order the steps. Yakko But you still have to do the steps, so how does reordering save money? The Wizard of Cost Well, reordering allows you to do three things. First of all, it allows you to plan your production so that you don’t have multiple production runs waiting on the same machine at the same time. This increases your production throughput, which lowers your cost of production per part as you produce more parts in a day. Secondly, if you punch before you cut, and you have a machine capable of doing multiple hole punches simultaneoulsy, you might be able to punch four or eight hinges on a sheet of metal simultaneously, which would increases your productivity eight-fold. Finally, it allows you to consider different machines given the partial state of completion the part is in at any one time. And this is where a lot of the power of the VPE comes into play. Maybe instead of a punch, you can use a laser drill that can drill 10 pieces simultaneously if they are stacked, but only if you have enough extra metal around the edges for the grips to hold the stack in place. If the laser drill costs you half as much to operate as the old punch, then you want to use it — which is something you can do if the hole creation step comes first, but not if the hole creation step comes last. Dot That sounds really neat! The Wizard of Cost It is, and it’s quite powerful. Yakko But how does the buyer know what the costs are? And doesn’t this take the supplier, who’s supposedly an expert in part manufacturing, out of the picture? The Wizard of Cost Good questions. Fortunatley, we have some good answers. The platform plugs into market feeds and our database of standard pricing that we have built up for North America and China, and this gives us a first level estimate. Secondly, it allows the buyer to enter their costs, or their supplier’s quoted costs, for each variable and refine that cost model further. Finally, it allows them to use a supplier’s VPE to calculate precise cost or set up a VPE specific to their supplier if their supplier does not already have one. In addition, we realize that the best results often come from collaboration and from taking advantage of expertise on both sides of the table, so we have been working hard on improving our supplier interface that allows buyers and suppliers to share designs and data back and forth, through a new CAD-independent viewer that’s coming out in our next release, so that both parties can work together. And, unlike some vendors, who shall go unnamed, that force suppliers to pay a registration fee to be listed in, or gain access to, their system, our basic viewer is totally free to the suppliers of any buyer who licenses our system. This keeps the supplier in the picture, in a non-cost prohibitive fashion, and helps the buyer find the best product at the best price, produced from the best production process, for their needs. In our view, that’s what enterprise cost management is all about. Dot That’s a really cool take. Yakko Not at all what we’re used to … coming from a sourcing world that has traditionally focussed on e-RFx, e-Auctions, contract management, and spend visibility to reduce cost. The Wizard of Cost It is a bit different, and we think it plays very nicely with those traditional approaches. Whereas they primarily reduce SG&A, and in the case of contract management, insure that agreed upon costs are adhered to, we primarily reduce COGS. It’s a big sandbox, we can play nice, and when we do, we think everyone wins. What do you think? Wakko I think I’d like to see more. The Wizard of Cost All in good time. Our next release, v6*, is slated for next quarter. Dot Then I guess it’s time to go! The Wizard of Cost Thank you for stopping by. And by the way, when you recount this story to the doctor, which I’m sure you will do, try not to leave anything out. Enterprise Cost Management is about a whole, and if you leave out any parts, it doesn’t really make sense. The Wizard of Cost Farewell and safe travels! Yakko Well that was different! Dot Not at all what I expected! Wakko And they didn’t feed us baloney sandwiches. I like baloney sandwiches. I’m hungry! Wakko So where are we going next? Yakko On to the B’s! Yakko They’re a consulting firm. We do products. Wakko Bravo Solution and their VerticalNet suite? Yakko We’d have to hike all the way to Pennslyvania, wouldn’t we? There are B companies locally. Let’s go visit BIQ! They’re just a few miles away in Southborough! Dot But we already did that at Ariba. That’s old news. Yakko the doctor says BIQ is different, and that how we define “spend analysis” is not the right way to define spend analysis. Yakko I don’t know. Let’s go find out! Tomorrow we recount the Sourcing Maniacs’ tale of their visit with BIQ. Stay tuned! *Editor’s note. Apriori released v6 in early October. You can find the press release here. This entry was posted in Manufacturing, Sourcing-Maniacs, Technology on October 21, 2008 by thedoctor.